In social media’s infancy, an online profile was just a way of staking out a little piece of cyberspace in order to connect with other people – an address in cyberspace. But as social networking expands is reach, the line between a person’s virtual self and “real world” identity grows increasingly blurred – as demonstrated by a recent ruling in one of the many lawsuits against Bank of America. Bank of America as we’ve written numerous times in these pages, is almost constantly in the legal crosshairs for misbehavior dating to the housing collapse of 2008, including the robosigning scandal, LIBOR stock manipulation and charges of instructing employees to stall certain kinds of loan applications. The latest case against the financial giant, filed by the Justice Department and a lengthy list of prosecutors and attorneys general, has to do with malfeasance over loans BofA sold to quasi-government lending agencies Fannie Mae and Freddie Mac. The case is going before a jury now, and that’s how social media got involved. A juror in the case learned that lawyers for the defense had investigated the juror’s profile on the popular business-networking site LinkedIn. The snooping was confirmed when LinkedIn notified its users who had viewed their profiles. Though LinkedIn profiles are viewable by anyone, the US District Court handling the case nevertheless determined that viewing the juror’s profile constituted making unlawful contact with a juror – a violation of pretrial rules. The firm’s actions won’t derail this case. The court simply instructed the juror to disregard the contact and the case will apparently proceed as planned. But, according to a report on HousingWire about the case, the incident sends a fascinating and chilling message. In the online world, you are your profile. The court’s decision that viewing the profile violated the no-contact rule in the same way physical contact would only serves to confirm that who you are in the virtual world and your “real” identity in the physical world are not so different – and social media sites like Linked In, Facebook and others take on a whole new status as a user’s virtual self. 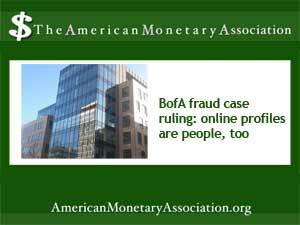 In Bank of America’s case, the trial will go on – and this breach of trial law most likely won’t affect the outcome. But in its ruling that viewing the profile was the equivalent of physically contacting the juror the US District Court in New York confirmed the power of social media to affect outcomes – and the virtual world has very real connections to the one we live and move in every day.